Address: 8200 West Gulf Blvd. Substantially reduced rate for annual rental! Enjoy a beautiful white sand beach at your doorstep! You will love this home. Relax in the shade of large pine trees and tropical vegetation in your private beach area and admire the gorgeous sunsets from one of your decks. 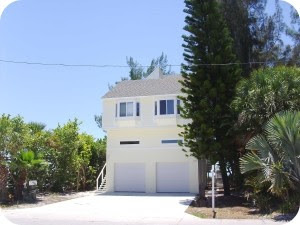 This terrific furnished beach home offers 3 bedrooms plus lofts (sleeps 10! ), 4 bathrooms, 3 decks, a galley kitchen with new appliances and an ocean view, a laundry room with full-size washer and dryer, a 2-car garage, a large walk-out room to the patio, outdoor shower, and air conditioning. The master suite includes 2 bathrooms with a whirlpool bath and large walk-in shower, wet bar, walk-in closet, and private deck. Cable with flat screen in each bedroom and living area and wireless high-speed internet is available throughout. A large-screen LCD HD television is provided in the open living/dining area. The loft features a private deck that can be used for very private sunbathing. The beach is ideal for lounging in the sun, long walks or jogs, and for shell hunting. The warm water is great for swimming, surfing, sailing, kayaking, snorkeling, scuba diving, and fishing. This beach home is located on a quiet street away from traffic in the Sunset Beach area of Treasure Island and you can enjoy walking to nearby fun beach areas including John’s Pass and St. Petersburg Beach. A golf course and tennis courts are available on the island. Other golf courses are close by. A variety of parks and trails for hiking and biking can be reached by foot or bike. Many other attractions are close by, such as museums, aquariums, theme parks, good shopping, and a variety of entertainment. Major league baseball, football, and hockey are all nearby when in season. Busch Gardens and Water Park/Adventure Island are a short drive away. For more information or to tour this great property, please contact Jim or Glenda at Tyler Realty. Florida Gulf Coast - Spectacular Gulf Beach Rental Home!